The Tax Foundation’s International Tax Competitiveness Index (ITCI) seeks to measure the extent to which a country’s tax system adheres to two important aspects of tax policy: competitiveness and neutrality. A tax code that is competitive and neutral promotes sustainable economic growth and investment while raising sufficient revenue for government priorities. Published annually, the ITCI not only compares OECD countries’ current tax policies but also reflects how tax systems have changed within the last year. 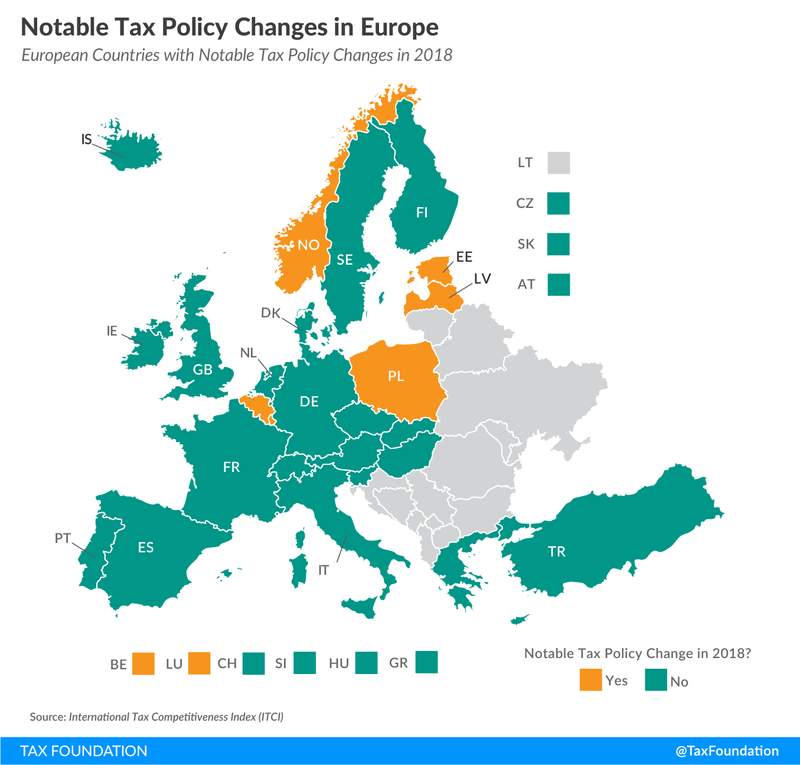 The following map highlights European countries that made notable changes to their tax systems in 2018. The Belgian government lowered the corporate income tax rate from 34 percent to 29.6 percent in 2018, with a further decrease to 25 percent planned for 2020. Additionally, Belgium raised its exemption for dividends earned by foreign subsidiaries from 95 percent to 100 percent and eliminated its tax on foreign-sourced capital gains. Compliance time for consumption taxes decreased from 100 hours in 2017 to 75 hours in 2018. As a result, Belgium’s ranking improved from 25th to 19th in the ITCI. Estonia increased its VAT registration threshold from €16,000 ($18,850) to €40,000 ($47,170), discriminating in favor of smaller businesses and thus creating an unlevel playing field. Estonia, arguably the country with the most efficient tax system in the developed world, remained ranked 1st in the ITCI despite this change. Following the example of Estonia, Latvia replaced its traditional corporate income tax system with a competitive cash flow tax model, only taxing distributed corporate profits and providing treatment equivalent to full expensing. Latvia now applies a corporate income tax at a rate of 20 percent, down from 25 percent. Due to this business tax reform, Latvia moved to 2nd place in the ITCI. Luxembourg replaced a previously repealed patent box with an 80 percent exemption on income from patents, software, and other intellectual property, creating special incentives for businesses to locate intangibles in Luxembourg. The country remained ranked 4th in the ITCI. Norway, known for its high corporate income tax (78 percent) on the oil production industry, reduced its general corporate income tax rate from 24 percent to 23 percent in 2018, with a further decrease to 22 percent in 2019. As a result, Norway’s ranking improved from 17th to 15th in the ITCI. Poland increased the top marginal tax rate on individual income from 38.8 percent to 39.9 percent. It also imposed an asset tax on certain financial institutions. Due to these changes, it dropped from 32nd to 33rd in the ITCI ranking. In today’s globalized world, it is essential for an economy to provide its citizens and businesses with a sound and competitive tax code to foster economic growth and well-being. Countries such as Estonia and Latvia have taken the lead in ensuring their tax codes do not create barriers to growth, setting an example for other countries to follow.